Sea lions are a constant complaint in Newport Harbor, but also a constant challenge in an effort to protect, yet deter them. The National Oceanic and Atmospheric Administration Fisheries shared sea lion deterrents during a presentation to the Harbor Commission on Wednesday. 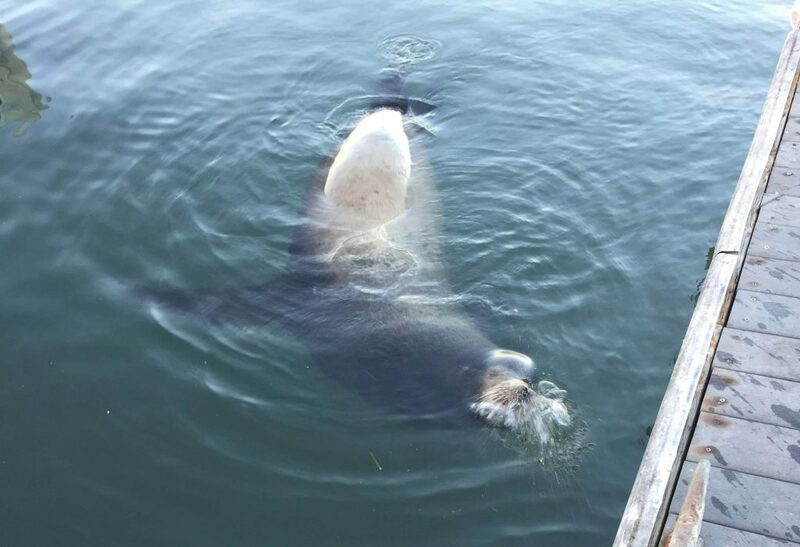 Boat owners and waterfront residents have complained for some time that sea lions are destructive and noisy. 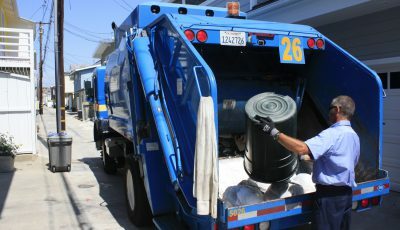 But how to humanely discourage them from hauling out on vessels and docks in Newport Harbor has been a challenge. The more that they can get involved and have the community work with them, the better, commented NOAA California Stranding Coordinator Justin Viezbicke commented. It’s a tough issue that they will have to work together to deal with over time, he added. The Marina Mammal Protection Act generally prohibits the harassment, hunting, capturing, or killing of marine mammals, or any attempt to engage in such activities, however, there are some non-lethal deterrence methods that can be used, explained NOAA Fishery Biologist Laura McCue. It’s about finding that balance, Viezbicke added. There isn’t one specific method that will work all the time, for every animal, he added. Recently, they have had some animals injured by screws securing rubber mats or wood, he noted, which has caused some concern. “These have gone a little bit further or beyond some of the traditional methods,” Viezbicke said. Some potential non-lethal methods for private property owners: Fencing, netting, horns, whistles, aluminum cans on a string, certain firecrackers (depending on municipal ordinances), pinwheels, high- or low-pressure water hoses, non-toxic and water-soluble paint ball or air soft guns (no metallic/glass/sharp projectiles), and more. Both NOAA officials and locals in the audience recommended SealStop, which “does not preclude animals from hauling out but makes it very irritating and uncomfortable for them to stay on. They get off the area quickly and remember to avoid it in the future,” SealStop officials explain on their website. “It’s like stepping on your kids’ Legos,” Viezbicke commented. 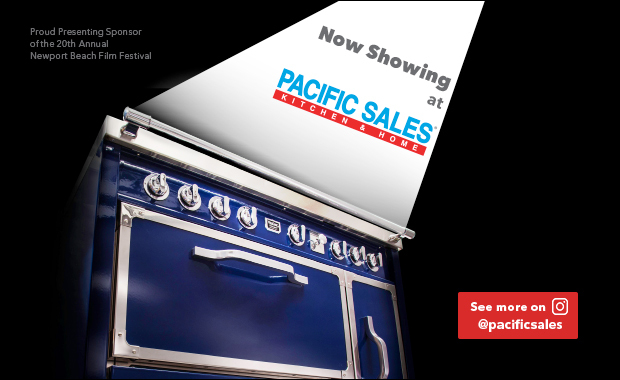 It can be installed on boats, docks. buoys and other surfaces prone to haul-outs in a variety of ways either as a permanent or a temporary solution, according to the company’s website. A public speaker asked how to get rid of them when coming across them on a vessel (hose, noise, etc., other methods suggested by NOAA). 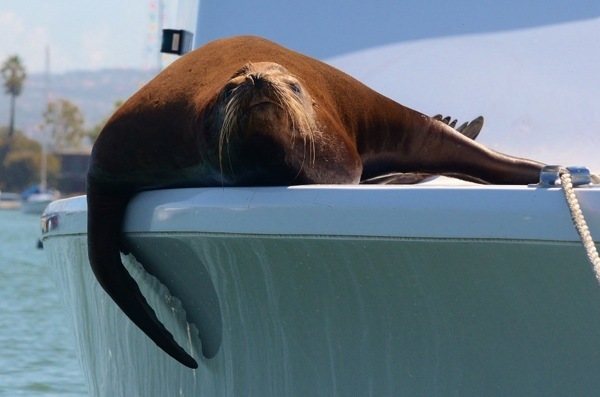 Driving by, but not too close the sea lion could jump in, on a Duffy or similar vessel, and using a loud noise, like an airhorn or even the boat horn, often drives them away, said Newport Mooring Association community outreach member Carter Ford. They may have previously interacted, many years ago, Viezbicke noted, but, in general, no, they aren’t a deterrent. Maybe the physical presence or loud barking of a coyote, or dog, might work, he added, but he hasn’t heard of fake coyotes or coyote urine actually working. 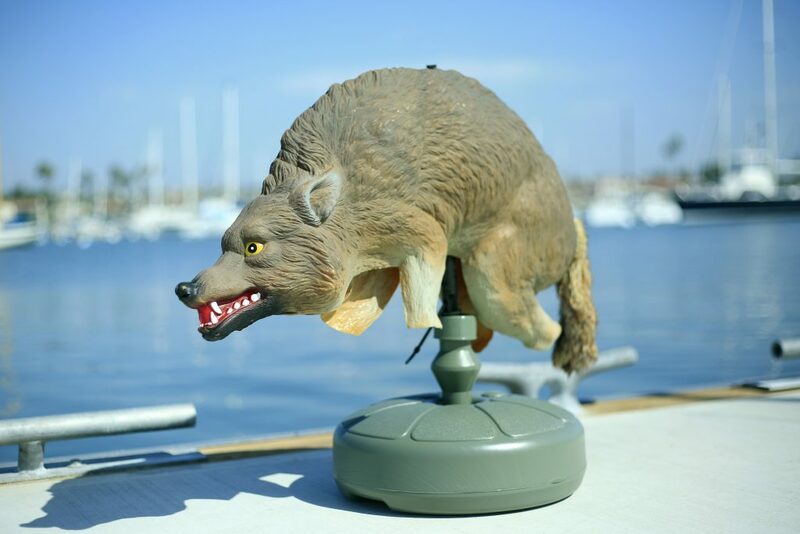 A plastic coyote decoy the Newport Beach Harbormaster team tested out in 2017 in an effort to deter sea lions from hauling out on docks and vessels in the harbor. In a creative effort to deter sea lions from camping out on docks and boats, Newport Beach Harbor Operations Division tried placing plastic coyote decoys in problem spots around the harbor in 2017. They had some success, scaring some sea lions away at first, although a few of the marine mammals wised up to the faux predators and were seen lying on a dock next to the decoys. A few years ago the department also tried a motion activated water sprinkler called Scarecrow. The concept was based on evidence that sea lions do not like water sprayed on them while they are hauled out to sun. But it was a bit finicky and required maintenance. Commissioner Ira Beer asked about the concept of using a dock specifically set aside for sea lions, as some have suggested trying in the past. “We probably haven’t heard the last of that,” Beer said. 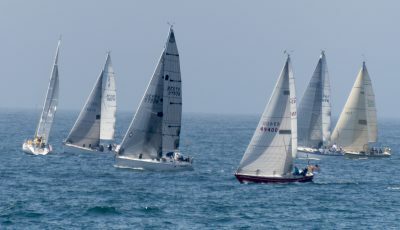 They are looking for a space to haul out and providing an area for them to do so would be an invitation into the harbor, Viezbicke commented. A designated area would likely get overcrowded and, since it would be an attraction for sea lions, the overflow would move back onto nearby boats and docks. “If you’re not wanting more sea lions in your harbor, don’t provide them more space,” Viezbicke explained. 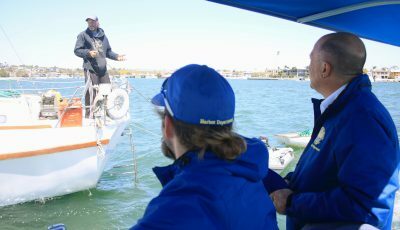 Harbor Commissioner Paul Blank, Assistant City Manager Carol Jacobs, and Harbormaster Kurt Borsting, visited Oceanside on Feb. 25 to learn about the city’s floating platform intended for sea lions’ use. According to Borsting’s Harbormaster Report later in the meeting, while Oceanside Harbor staff have reported a reduction in the number of unwelcomed incidents of sea lions boarding private vessels, marina docks and other public infrastructure since the deployment of the floating platform – other less desired outcomes have also been attributed to the platform. Negative impacts include increased noise concerns (from barking sea lions using the platform, particularly when it gets crowded and they are fighting for space) and on-going unwanted interactions with the sea lion population by harbor visitors who treat the platform as an area attraction/point of interest (which was not the structure’s intended purpose). 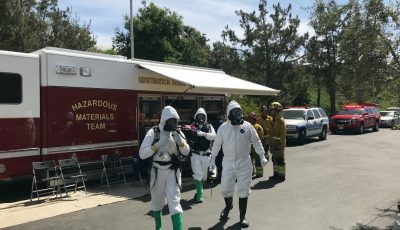 “These concerns and other factors deserve additional research before a similar platform is considered for locations within Newport Harbor,” Borsting wrote. Education and public awareness are key, Yahn commented. He suggested sharing an informational brochure that explains what is humane and permitted, and what is harmful to the animals, while patrolling the harbor. A few other commissioners supported the idea of a “best practices” brochure.